Two drones were first seen flying over the Gatwick Airport airfield at around 9pm yesterday evening. 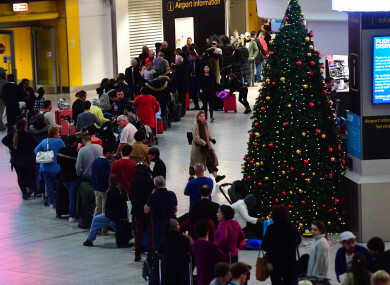 THE UK Has called in the army to help police hunt a drone pilot who grounded all flights from Gatwick airport, leaving thousands stranded on one of the busiest days of the year. The airport closed its only runway late last night following “reports of two drones flying in and around the airfield” and further sightings today, according to Gatwick’s CEO Stewart Wingate. The closure, which remains in place at the time of writing, stranded tens of thousands of travellers days before Christmas – and prompted the unusual military operation. Sightings of two drones flying over the Gatwick Airport airfield were made at around 9pm yesterday evening, the airfield was closed until 3.01am while the situation was investigated alongside Sussex Police. However, after further sightings of drone in the vicinity of the airport, the runway was closed again from 3.45am. The shutdown has led to a number of flights being diverted to other airports while aircraft have been unable to depart from Gatwick. Some 10,000 passengers were affected last night, and a further 110,000 were due to either take off or land at the airport on 760 flights today. “Our airlines are working to provide affected passengers with hotel accommodation or transport passengers landing at other airports to Gatwick by other means, and Gatwick staff are looking after passengers in our terminals,” the airport said in a statement this morning. The airport has this afternoon said that flights will remain cancelled up to at least 4pm today, while the situation is reviewed. More than 20 police units from two forces have been searching for those responsible. Gatwick Airport added: “There is a significant disruption as a result of what appears to be a deliberate attempt to disrupt flights. We are extremely disappointed that passengers are being affected, especially at this time of year. Anyone flying from Gatwick Airport, or following someone from the airport today, is being asked to check the status of their flight. “Unfortunately, there are significant delays and cancellations to all flights today,” it said. Dublin Airport has said that “passengers travelling to Gatwick Airport should check with their airline”. Passengers travelling to @Gatwick_Airport should check with their airline. We will also continue to update this account during the day. A Shannon Airport spokesperson has also confirmed that the airport facilitated a number of diversions due to the temporary closure of Gatwick. “At this time, we are unaware of the respective airlines intentions for these passengers onward travel plans. Further diversions may be expected,” the spokesperson said. Shannon Airport’s own flight service is operating to schedule. Under British law, drones cannot be flown near aircraft or within a kilometre of an airport, or at an altitude of over 400 feet. Those breaking the law could face up to five years in prison. Gatwick Airport serves more than 228 destinations in 74 countries for 45 million passengers a year. Under British legislation, drones cannot be flown near aircraft or airports, or at an altitude of over 400 feet. Email “British army called in to hunt drones that left flights grounded at Gatwick”. Feedback on “British army called in to hunt drones that left flights grounded at Gatwick”.